Empowering, harmonising and nourishing. The classically sensual, rich sweet-floral and slightly fruity fragrance of Jasmine Absolute is ultra relaxing and uplifting to the emotional system, and also highly beneficial in skin care treatments. A few drops of jasmine added to an unfragranced cream or lotion base brings relief to hot, dry, irritated or sensitive skin, as well as assisting in the removal of blemishes and generally improving the complexion. Used in both Ayurvedic and Chinese medicine, Jasmine has a deep-acting hormonal-like action that has an affinity with the female reproductive system making valuable for relieving the symptoms of PMS, reproductive issues, and the menopause. Jasmine Absolute is both relaxing and stimulating to the senses, which explains its renowned reputation as an aphrodisiac; it promotes a state of calmness and peace which helps to liberate sexual hang-ups allowing sexual energies to be released naturally. It is also valuable as an aid to surviving emotional trauma, boosting confidence and self-esteem, and provides strength to those suffering from doubt and fear. Please note; Jasmine Absolute is a little thicker in consistency than most essential oils, and may need warming to make it mobile enough to dispense. Simply place the bottle in a cup of warm water for 10 to 15 minutes to get the oil flowing properly. 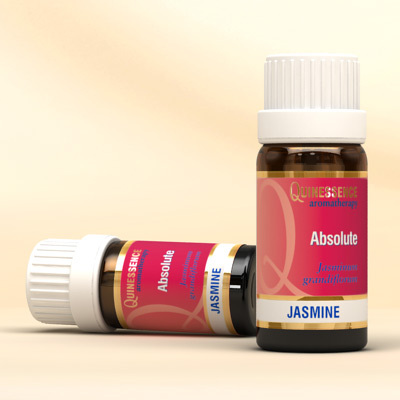 Jasmine Absolute is also available from Quinessence as a 5% Dilution. Benzyl acetate, Benzyl benzoate, Linalool, Phytol, Isophytol, Isophytyl acetate, Geranyl linalool, Jasmone, Eugenol, Indole.